Hon. Prime Minister of Antigua & Barbuda Gaston Browne told ABS News Wednesday that 60% of the residents of Barbuda are now homeless. An infant was the island’s only fatality. This, the prime minister said happened when the mother was attempting to run to safety. Prime Minister Browne said his government will do whatever was necessary to secure housing for all residents. This is made even more urgent by the news of Jose becoming a Hurricane. It is expected to impact parts of the Eastern Caribbean by the weekend. The island is without communication as the main tower was literally snapped in two by the hurricane with winds of 185mph. Barbuda is also underwater and the official said that over the next 18 hours they will be making arrangements to ensure residents would be safe. 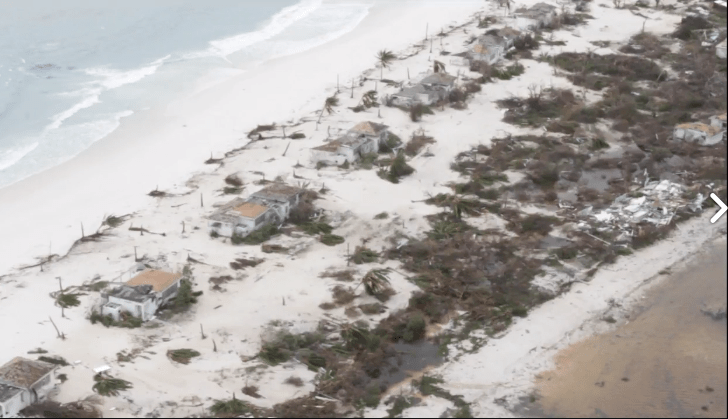 Screenshot from ABS TV of Barbuda from the sky. The leader of government is urging those who can move to Antigua and stay with friends and family to do so. He said they are working to bring in construction supplies and other immediate needs. He expressed thankfulness that Antigua was spared and pledged to do what was necessary to bring Barbuda back to normalcy.